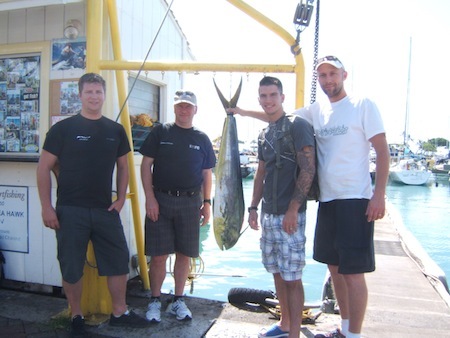 Travis, Ross, Scott and Mike with their Mahi Mahi and Aku! 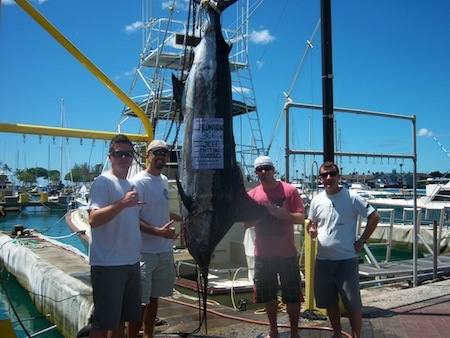 Mahalo to Travis, Ross, Scott and Mike for choosing Maggie Joe Sport Fishing! 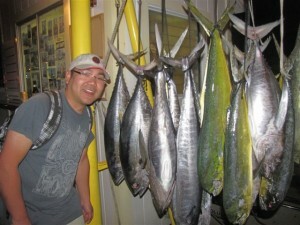 They joined us aboard the Ruckus on a sport fishing charter with Captain Matt and Mate Billy. It was a nice day out on the water as the guys hauled in 2 Mahi Mahi and 1 Aku while deep sea fishing outside of Honolulu, Oahu! Enjoy the fish! Aloha! Dan with his 95 lb Ahi! 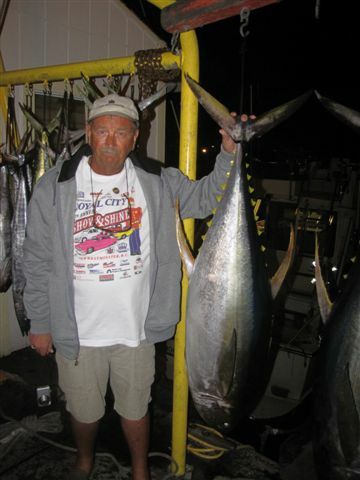 Dennis with his 100 lb Ahi! Enclosed are some pics. of the shared charter aboard the Ruckus with Captain Matt and deck hand Bill taken on our Jan 4 2012 outing.First I would like to Thank both Fatima and Jessica for making this second trip for me possible on relatively short notice and some computor gliches in the booking of this trip. 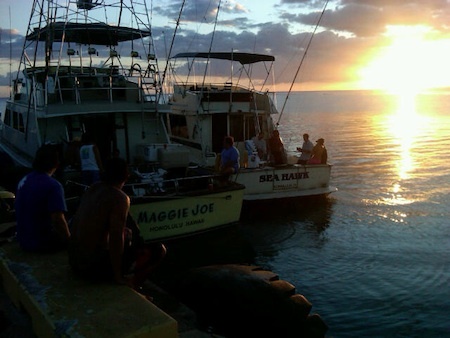 This was my second outing with your company as I had done a familiy charter aboard the Maggie Joe on Dec 20 2011 I showed those pictures to my buddy Denis and convinced him that we had to do this again(which wasn’t hard) before leaving the Island on Jan 6 2012. This turned out to be a great choice as we had an absolute blast of a day with something like 27 fish landed in the boat! 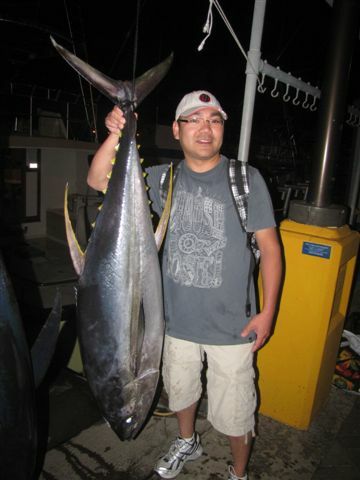 This was Denis’s first time out and he will remember this trip for some time as he landed a 100 lb yellow fin Tuna! Also Thank-you to Dan(95Lb yellow fin) from California and the the father and son from Russia whose names I don’t remember, that I had the pleasure of sharing this trip with. Bobby, Gabriella, Knox, Sam and Joe with 4 Mahi Mahi! 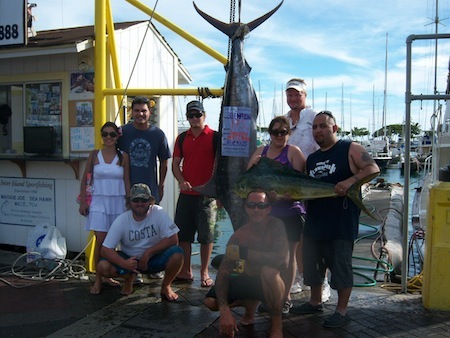 Mahalo to Bobby, Gabriella, Knox, Sam and Joe for choosing Maggie Joe Sport Fishing! The group spent the day on a sport fishing charter aboard the Ruckus. They hauled in 4 Mahi Mahi while deep sea fishing outside of Honolulu, Hawaii with Captain Matt and Mate Billy! Aloha! Angler Jeff with Chris, Captain Matt, Mate Billy and 185 lb Blue Marlin! 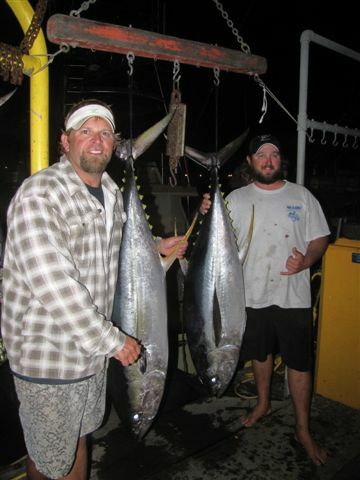 Mahalo to Angler Jeff and his buddy Chris for choosing Maggie Joe Sport Fishing! 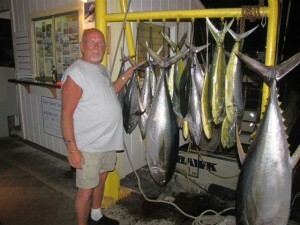 The pair joined Captain Matt and Mate Billy aboard the Ruckus on a sport fishing charter. They departed Kewalo Basin, next to Waikiki, and spent the day deep sea fishing outside of Honolulu, Oahu. Jeff hooked up with this nice 185 lb Blue Marlin and reeled in that bad boy like an old pro! Congratulations and Aloha! 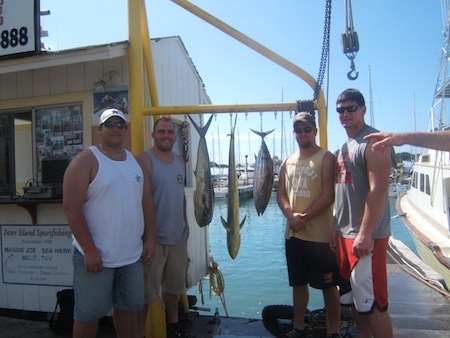 Mahalo to Rob, Jim, Aaron and Mark for choosing Maggie Joe Sport Fishing! 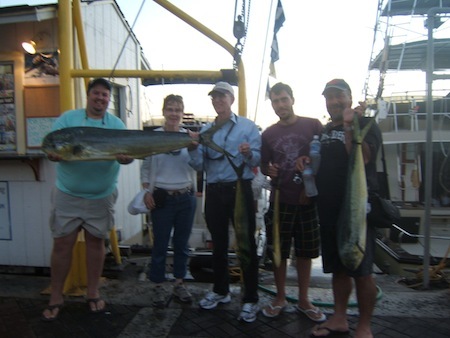 The group joined Captain Matt and Mate Billy aboard the Ruckus on a sport fishing charter. 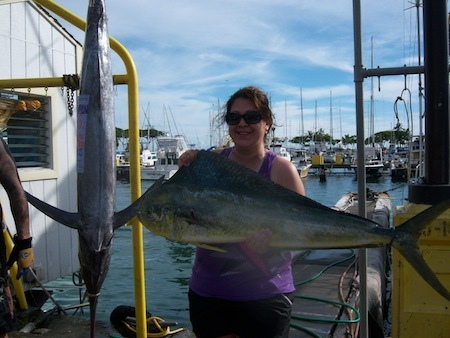 While deep sea fishing outside of Honolulu, Oahu they caught this nice female Mahi Mahi… good eating! Enjoy! Tony, Grace and Gehrig with 3 Mahi Mahi! 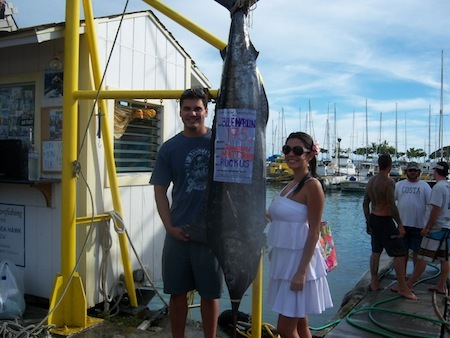 Mahalo to Tony, Grace and Gehrig for choosing Maggie Joe Sport Fishing! The trio departed Kewalo Basin, next to Waikiki, aboard the Ruckus on a sport fishing charter. 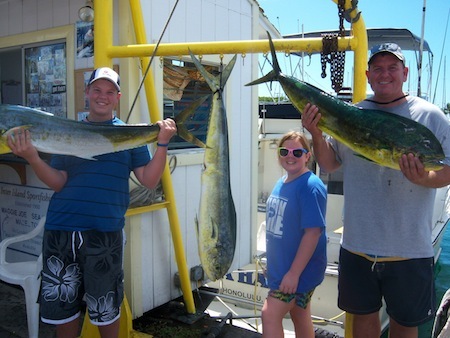 The Mahi Mahi were biting today and they hauled in these three nice fish! Aloha! Johnathon, Rosemary, Melvina, John, Tom and Ben with Captain Matt, Mate Tony and 175 lb Blue Marlin and Mahi Mahi! Melvina with her Mahi Mahi! Newly wed's, Johnathon and Rosemary with their 175 lb Blue Marlin! 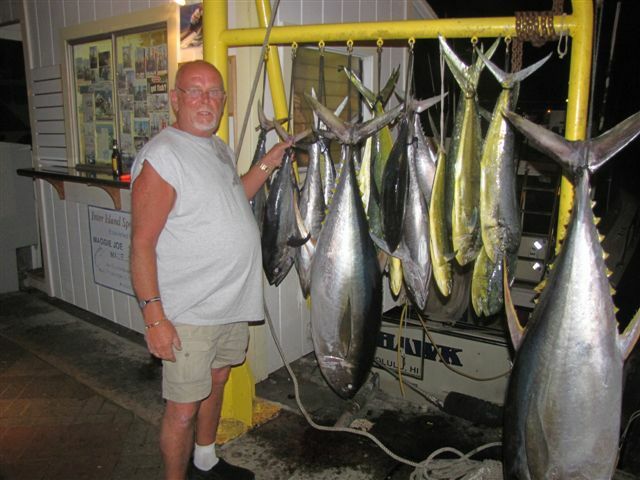 Mahalo to Johnathon, Rosemary, Melvina, John, Tom and Ben for choosing Maggie Joe Sport Fishing! The group joined Captain Matt and Mate Tony aboard the Ruckus on a full day sport fishing charter! The group departed Kewalo Basin, next to Waikiki, in the early morning and spent the day deep sea fishing outside of Honolulu, Oahu. Melvina hauled in a nice Mahi Mahi and newly wed’s, Johnathon and Rosemary reeled in a 175 lb Blue Marlin! Congratulations to the newly wed’s and aloha everyone! 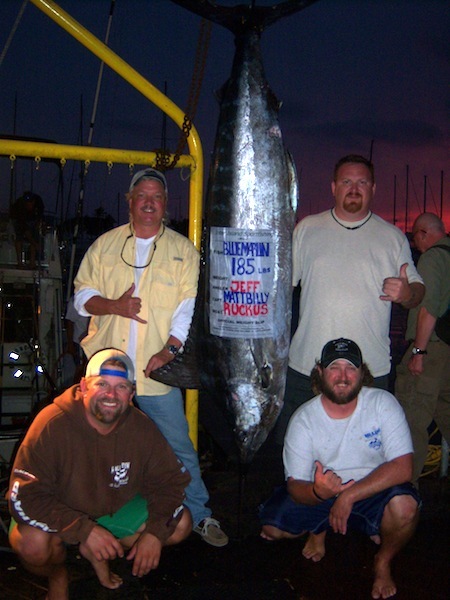 Angler Jeff with 366 lb Blue Marlin and Wes, Wayne and Andrew! Mahalo to Jeff, Wes, Wayne and Andrew for choosing Maggie Joe Sport Fishing! The group departed Kewalo Basin, next to Waikiki, on a half day sport fishing charter aboard the Ruckus with Captain Matt and Mate Billy! While deep sea fishing outside of Honolulu, Oahu Jeff got on the end of this 366 lb Blue Marlin, climbed in the fighting chair and reeled her in! Great job and aloha! The Maggie Joe crew left for Molokai on Friday and will be a watch boat for the Annual Women’s Canoe Race from Molokai to Oahu. Check out our facebook page for more photos on the race and Friday night pre-race festivities! Aloha!